The people of Tipperary got a chance to view the world through the eyes of drivers with disabilities recently with the ‘Back in 5’ parking campaign aiming to draw attention to the abuse of accessible parking bays. The Irish Wheelchair Association (IWA) Tipperary Branch, in partnership with the HSE’s Tipperary Gold Star initiative and Cashel/Tipperary Municipal Council, worked together with volunteers and other disability organisations to organise and run the ‘Back in 5’ campaign in Tipperary town. 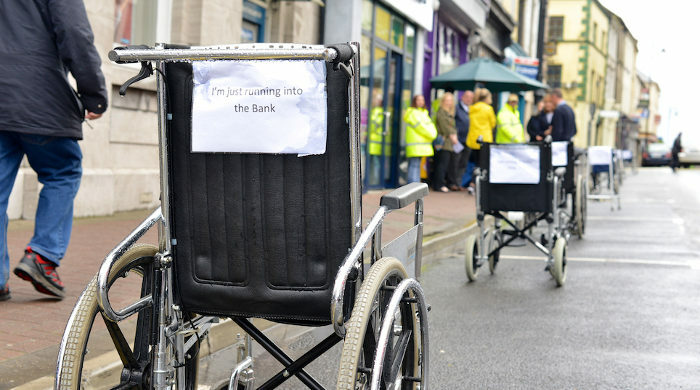 As part of the awareness campaign, 10 regular car spaces on the street had empty wheelchair parked in them for 90 minutes one morning with a note pinned to the back with messages such as ‘be back in 5 minutes’, ‘just gone to the bank’ or ‘running in for a coffee’. These are the throwaway statements that people with disabilities encounter every day when people use accessible spaces that they do not need. 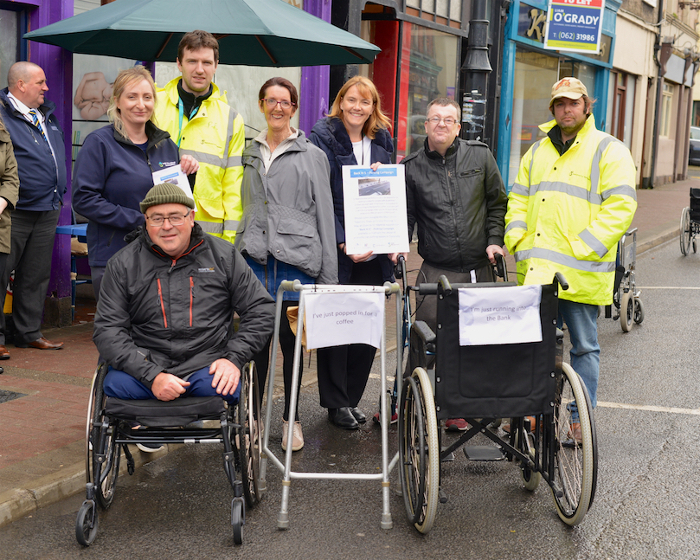 The campaign aims to draw attention to the abuse of accessible parking bays and to highlight the need for more accessible parking bays in the town centre. Accessible car spaces are located nearest to building entrances or lifts to make it convenient for people with limited mobility or those using wheelchairs to access services. It is important that these spaces are not abused in any way. Paul Cunningham from Tipperary explained why he got involved in the campaign. The campaign is based on the Lisbon Experiment in Portugal in 2014, which was a campaign designed to highlight the frustrations people with disabilities face every day when able-bodied people park their cars in wheelchair accessible spaces without a valid parking permit or reason to do so. In Ireland, a similar campaign was rolled out in Navan last year with the support of the North East Region IWA. The campaign in Tipperary was hailed as a massive success. Anne Bradshaw of HSE Disability Services paid tribute to everyone who worked so hard on it, both behind the scenes and on the day. “The IWA members, management and staff came out in the most horrific weather conditions. The campaign is gaining phenomenal positive reactions on social media and was worth all of the hard work getting it off the ground,” said Anne. She also paid tribute to Josephine Carroll of the IWA who managed to organise, unload and arrange 12 wheelchairs on the street in the pouring rain, fresh from A&E with her right hand in bandages and stitches. “The event reflected a strong sense of community spirit in Tipperary town, where people work together to ensure social inclusion for all. Without the support of the business community, the Back In 5 campaign would not have worked,” she said. She also highlighted the support from local schools who sent TY students to the event to get feedback from passers-by, An Garda Siochana for blocking off the car spaces on Main Street and Tipperary County Council for their support. “All in all, the campaign has been hugely positive and we have many requests to repeat the event in other towns in County Tipperary over the summer,” added Anne.